While Samsung and Apple continued to occupy long-time number one and two spots in the global smartphone market in the second quarter of the year, Chinese Android OEMs Huawei, Oppo and Xiaomi are continuing to close the gap. 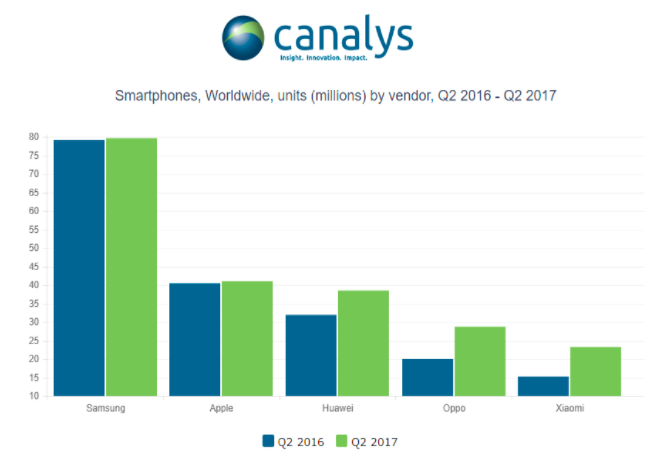 Analyst Canalys’ latest smartphone market figures show third placed Huawei now nipping right at Apple’s heels. It said Huawei shipped 38 million units in the quarter vs Apple’s 41 million iPhones, with year-over-year growth at 20 per cent and two per cent respectively — the latter despite anticipation building for a significant iPhone refresh later in the year. Apple reported strong earnings itself yesterday, with investors especially excited about signals of a mega Q4 in its pipeline. Yet consumers evidently didn’t hold off buying iPhones entirely in Q2. Global smartphone market leader Samsung shipped more than 79 million units in the quarter, although its year over year growth was “relatively flat”, and its lead is also being eroded by faster growing Android OEM rivals. The analyst suggests its therefore hitting a pricing ceiling for its Galaxy brand as multiple rivals work against premium pricing in the Android space — a competitive factor that may even limit Apple’s room for making upward price manoeuvres when it refreshes the iPhone. “As Apple looks to refresh the iPhone, even with its unique user experience, it too must justify any significant price increases with tangible improvements to both feature set and design,” he added. Overall, more than 340 million smartphones shipped in Q2, an increase of almost 4 per cent year on year. Although the analyst noted that smartphone markets in India and China both slipped into decline in the quarter. In North America, it said smartphone shipments in the second quarter increased around 7 per cent, year on year, while Apple grew iPhone sales by 10 per cent — again despite consumer anticipation for a flagship update in fall (and the launch of Samsung’s Galaxy S8 flagships).